Treat yourself, or someone special, to this all-star assortment of face and body essentials. Perfect for sprucing up after a workout, this lineup comes with a zip-up nylon pouch to keep your workout bag in check. This combo gives you everything you need to keep your beard clean and healthy at a discounted price. 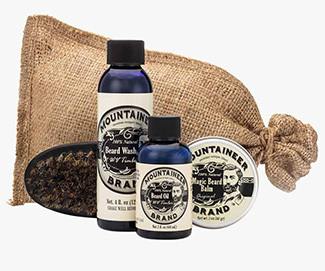 The complete beard care kit includes a beard wash, beard oil, beard balm, & a military-style beard brush all packaged in a burlap bag making it the perfect choice as a gift or to buy for your own beard.